Avatars, sometimes called buddy icons, are a fun way of representing oneself in cyberspace without using photographs. Many of the early avatar generators were rather simplistic but now they can be customized and even animated with a wide variety of backgrounds. One avatar site with a fast-growing membership is Meez with one million fans already signed on, half of those in the first three months of this year alone. With Meez, you can create your own look for free although certain options cost. Choosing hairstyles and facial features allows ample opportunities to up one's beauty quotient. 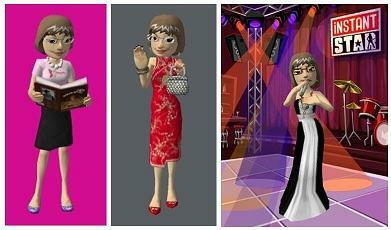 You can choose from many styles of clothing right down to accessories like jewelry and store them in a virtual closet. The avatar I chose to use for my blog wears a white chunky beaded necklace. For my semi-formal cheongsam outfit, I chose a gold medallion necklace with matching. hoop earrings and bracelet. For formal occasions, a multi-tiered necklace and matching earrings to brighten up the long evening gown. So go ahead and ramp up the vamp factor all the way to divahood! Singing talent not necessary.